According to the assumptions of the Territorial Air Defence made in the second half of the 1950s, for employees and residents of newly constructed residential, administrative and commercial buildings in air-raid threatened cities, it was required to build category 4 (lowest) shelters. While designing the number of shelter spots, one had to consider the following guidelines: in residential buildings of cubic capacity larger than 4,000 m3 and over two storeys – for 50% of residents; in residential buildings with commercial premises (shops, restaurants, etc.) – for 50% of residents, 25% of the maximum number of customers and 25% of staff; in cinemas, theatres, cultural centres, etc. – for 30% of spectators and staff jointly; in primary and secondary schools – for 50% of students and staff; in universities – for 25% of students and staff; in hospitals – for 30% of patients and 25% of staff; in kindergartens and nurseries – for 100% of children and staff. 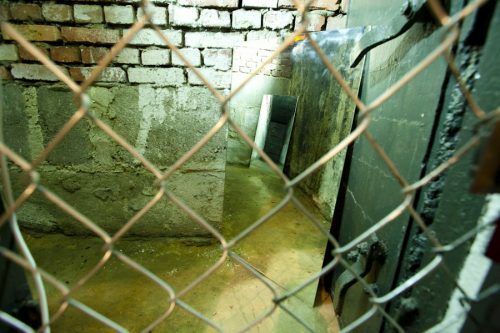 In a vast majority the shelters were located in buildings’ basements as structures completely hidden under the ground. There was also an option to construct them as free-standing buildings, however it required a special permission on the ministry level. Shelters could not have any windows and a departure from this rule was permitted only upon the consent of provincial headquarters of the Territorial Air Defence. The shelter’s location in a building was also a matter of great importance. It could not adjoin a boiler room, fuel storage or combustibles and explosives storage, and if several shelters were located in one building, the distance between their outer walls should amount to 10 m at the least. They were supposed to be located near staircases in order to provide efficient communication, however at least one such staircase should be of the same strength as the shelter itself. It was also prohibited to install high-parameter gas, water and steam systems and high-voltage direct current systems through the shelter rooms. The capacity of a shelter was to amount to minimum 50 and maximum 250 persons – 0.7 m2 of floor space per one healthy person and 1 m2 per one ill person in hospital shelters. The required floor space was calculated excluding hallways, access routes, toilets, air filtering and ventilation chambers, etc. The height of a typical shelter amounted to 2.2 m or minimum 1.90 m in the case of any protruding elements. A shelter had to consist of: antechambers by the exits, shelter chambers, toilets and taps with basins, air filtering and ventilation chambers, as well as an emergency exit. 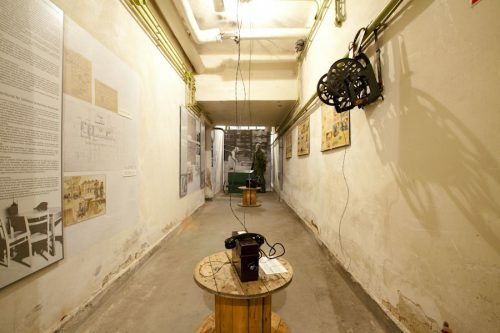 At the request of the Territorial Air Defence authorities, it was also possible to arrange additional rooms, e.g. decontamination chambers (showers with changing and dressing rooms), doctor’s room, battery room or sickroom. Antechambers were supposed to be designed at every shelter exit and their minimum dimensions were 1.4 m by 1.4 m; in the event of hospital shelters they had to allow injured people be carried in on stretchers (one of the dimensions is 2.5 m). All antechamber doors had to be protective and gas-tight with a minimum dimension in the clearance of 0.8 m by 1.8 m, while the external doors were to open outside. Shelter chamber could not be larger than 36 m2, while the longer wall could not be longer than 6 m. Shelters dedicated for more people were divided into several chambers where every chamber could accommodate maximum 50 persons. Seats (benches) were placed in rows back-to-back and their length was a multiple of 50 cm (one seat). Where necessary, the benches could be attached to bunks, yet the required minimum height for placing them was 160 cm above the floor level, in order to allow free access to seats. Sanitary facilities were located in a separate part of a shelter. The following assumptions were made in the designing process: one toilet set with a water-closet bowl was provided for every 50 persons, a sink with a tap for every 100 persons, and additionally it was advised to provide one metre of urinal trough or one ceramic urinal for every 100 persons. In toilets there was also an exhaust duct, secured with a tight hatch or a damper, allowing to remove the exhaust air from the shelter. Air filtering and ventilation chamber was a separate room with a filtering and ventilation unit composed of a fan, hood filters, ducts with dampers, and measurement devices. One of three types of filtering fans was used: RM-100, RM-200 or RM-300 with capacity of 100, 200, 300 m3/h. It was possible to install a maximum of two units in one chamber, and in order to calculate the minimum capacity the following assumptions in terms of air demand were made: for healthy persons – 1.5 m3 per hour per person, for ill persons – 2,5 m3 per hour per person, in work rooms – 6-10 m3 per hour. Additionally, the amount of air supplied should ensure that air in all rooms is exchanged at least once per hour. Emergency exit was designed as an underground tunnel turning by the building’s wall, ended with a vertical exit shaft with clamps, leading out of area subject to obstructions, that is half of a building’s height plus three metres. The tunnel was to be covered with a 20 cm layer of soil, at the least. The shelter was separated from the emergency exit tunnel with gas-tight safety doors, opened outside.